Just a little bit different! CHECK THE FOR SALE PAGE FOR ONLINE SALE INFORMATION FOR 2019! Welcome to the online location of the KF-Acres operation. This website has proven year after year to be a valuable tool in public awareness, marketing, and merchandising of our breeding stock and the products they produce (fleece/ meat). As of April 2016, at KF-Acres we now only raise Columbia, and Rambouillet; white and naturally colored sheep. After 16 years of raising registered Oxford sheep, we have closed the door on that chapter and the flock has a new home. We also sell fleece from our many breeds- Columbia, Rambouillet, Corriedale, Dorset, Merino, Romeldale--- and many more. Get in touch today! Feel free to browse, and be certain to view our current stud ram lineup! Conveniently located at the intersection of two Interstates and four IL State highways! -one half hour east of the Illinois State Fairgrounds, 1/2 mile from I-72! 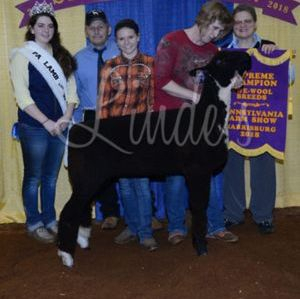 Dammed by KF-Acres "Untouchable", Grand daughter of "Cabela"
Champion Ewe Drive 2016 IL State Fair! 3 of the 6 ewe lambs were bred and raised at KF-Acres! KF-Acres 1727 "Throne" QR ("Fire" x "Cabela").